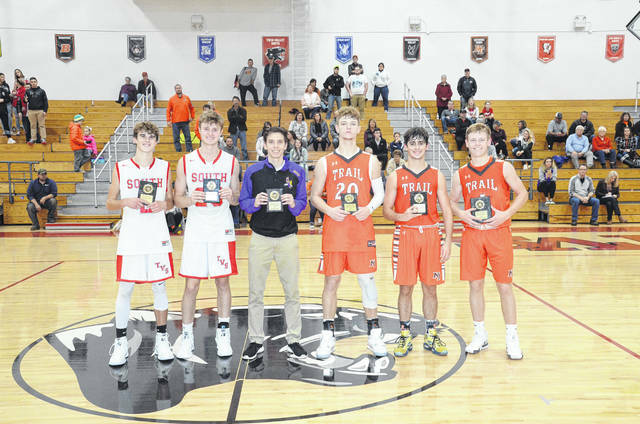 The all-tournament team included Jayden Bassler and Cole Peterson of Twin Valley South, Dylan Jackson of Eaton, Zach Woodall, Adam Eyler and Cameron Harrison of National Trail. National Trail defeated Twin Valley South 40-31 in the championship game of the 7th Annual Twin Valley South Tip-Off Tournament on Saturday, Dec. 1. WEST ALEXANDRIA — It wasn’t a thing of beauty by any stretch of the imagination but it was effective enough to get the job done. On the verge of being blown out of the gym in the first quarter, National Trail’s boys’ basketball team recovered just enough to hand host Twin Valley South a 40-31 setback in the championship game of the 7th Annual Twin Valley South Tip-Off Tournament on Saturday, Dec. 1. 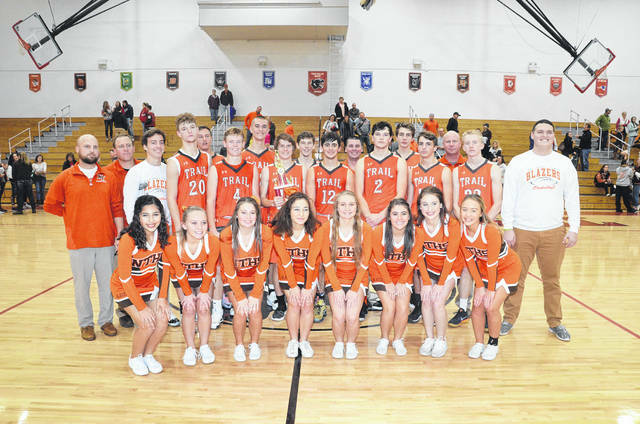 As good as both teams looked on Friday – Trail beat Eaton 61-38 and South rolled by Dixie 62-38 – in their respective semifinal games, each struggled at some point in the championship contest. Trail missed all 12 of its shots in the first quarter and was behind 9-1 after the first eight minutes. But the Blazers turned the tables on South in the second. After missing its first two shots of the quarter, Trail connected on its next six shots to eventually tie the game at 9-all and a forge ahead 17-15 by the end of the quarter. Sophomore Cameron Harrison, who was named the Most Outstanding Player of the tournament, scored 13 of his game-high 21 points in the second quarter. South helped the Blazers cause turning the ball over seven times, while only taking seven shots. In the third quarter the lead changed hands four times with South taking a 27-25 lead into the fourth quarter. A three-pointer by Adam Eyler gave the Blazers a 28-27 lead early in the fourth. Ryan Delong responded for South to put the Panthers back up 29-28 with 6:58 left in the game. From there, Trail controlled the game holding South scoreless for nearly six minutes, while going on an 11-0 run that started with a three-pointer by Josh Bishop. By the time Willie Bowman scored for South, with 1:01 left, his team trailed 39-29. South coach Tony Augspurger knows his team had a chance to put the game away early. Jayden Bassler led South with 11 points. Making the all-tournament team was Eaton’s Dylan Jackson, South’s Jayden Bassler, South’s Cole Peterson, Trail’s Zach Woodall, Trail’s Adam Eyler and Trail’s Cameron Harrison. In the consolation game, Dylan Jackson scored a game-high 20 points to lead Eaton to a 54-36 win over Dixie. James Howard added eight. Travis Pittman and Hunter Frost each had seven. With the win, Eaton snapped a 22-game losing streaking. The Eagles last win came in the consolation game last season. “It was good to get a win,” Eaton coach Denny Shepherd said. “Yesterday and tonight, I think their effort’s always been there. It’s some growth. I’m proud of the boys. We’ve got to go get another one on Tuesday. The Eagles and Greyhounds were tied 12-12 after one and Eaton grabbed the lead, 23-20, at the half. Eaton opened the third quarter with an 11-4 run to take a 34-24 lead with 3:16 to play. Dixie trimmed their deficit to seven, 35-28 with 1:24 left. Eaton closed out the quarter on a 4-0 run for a 39-28 lead. After Dixie cut the lead Eagles lead to 44-35, Eaton then went on a 10-0 run to secure the win. National Trail (2-0) is scheduled to host Bradford on Friday, Dec. 7 and Preble Shawnee on Saturday. Twin Valley South (1-1) was scheduled to play at Valley View on Tuesday, Dec. 4 and at Waynesville on Saturday. Eaton (1-1) is off until Tuesday, Dec. 11, when it returns home to play Brookville.